After the holiday list came (in end of December), the first thing I did was book a ticket for the Jan 12-14 weekend. 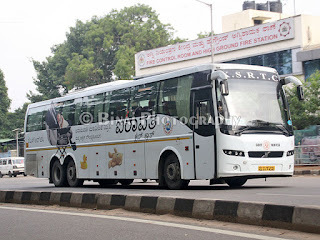 I decided to book the return ticket first – I chose Karnataka SRTC after a really long time. My superior in office is a regular passenger in the 2131hrs Thrissur-Bangalore Airavat Club Class – he vouched for its early arrival in Bangalore. I’ve never tried this service, so decided to use this as an opportunity to use this bus. Booking was simple – the fare is only Rs. 874, including the reservation charges – that was less than the Rs. 1000~1250 charged by private operators. I was really looking forward for this trip. 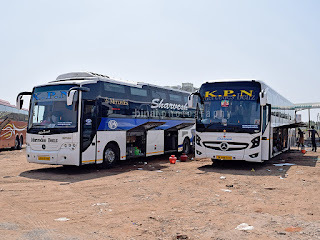 The outbound trip was by the maiden trip of Kallada’s Volvo B11R (Read the review here). However long the vacations are, it is a very heartbreaking experience to leave home – this repeats every time. Reluctantly, I left home at around 2015hrs. My brother and dad were along. Although it was on a Monday evening, roads were fairly free. Sometime around 2100hrs, my mobile phone beeped – “Your Bus Details for the PNR Jxxxxxxxx are ....” The message had the bus number, operator depot’s name and even the crew’s mobile number – that was amazing. I was dropped outside the KSRTC bus station in Thrissur at 2115hrs. I somehow like it this way – minimal but adequate waiting time. I walked into the KSRTC bus station to be greeted by heavy crowd – the bus station was packed to the core. I saw a Volvo rear view mirror among the line of buses – I thought that is my bus, and rushed towards it – but there not one, but two – Kerala SRTC low floor Volvo buses. One was JNK44 heading to Kozhikode, and the other was JNK43 heading to Ernakulam. It’s a pity that KeSRTC decided to operate these city buses on such long routes. I checked the Karnataka SRTC reservation counter at Thrissur – the conductor of my bus was seen there, getting the reservation chart. I walked further towards the fuel station. I saw my colleague standing there – we both were travelling on the same bus to Bangalore. We chatted for some time. In the meantime, our bus slowly crawled out of its den, and parked neared the fuel station. Sometime later, they moved the bus forward and parked it near the Garage. This was the “platform” for our bus. There was one more KaSRTC bus (an Airavat) working special service to Bangalore, and that was parked right next to us. The conductor was double checking tickets before letting passengers in, since both the buses had similar departure times. I flashed my m-Ticket to him – he asked me the seat number and my PNR number. Once he confirmed the same, let me in to the bus. My seat was #16 – a window seat on the right side of the bus. FM radio was on – I was elated to hear Malayalam songs in a KaSRTC bus! My bus: KA-01-F-9346 of Bangalore Depot-4. Image from Archives. 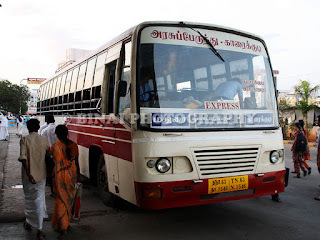 Sometime around 2130hrs, the bus was moved forward, and parked in the “Coimbatore” Platform of the bus station building. The conductor got some 11 passengers to Palakkad, and two tickets to Bangalore (against passengers who did not report). We started off at 2138hrs – a delay of 7 minutes. The driver meant business in the initial few minutes – he ripped through the ring road, and we joined the main road to Palakkad in no time. After getting on to the main road, the driver started crawling on the top gear – the engine was crying out loud for mercy. After Mannuthy, the driver picked up speed – and he was overtaking other vehicles mercilessly. The driving was typical government style – he gave a damn to potholes. It looked like this driver was a regular on the Kerala route. I tried hard to sleep, but the bad roads created a lot of misery for me. I couldn’t sleep. The front curtains weren’t put in place as well. The driver was too good – his style was very un-KaSRTC styled. He maintained good pace for most of the time. The bus stopped at Alathur to drop a couple of passengers. One passenger wanted to be dropped outside his house (less than 100meters away from the bus stop) – the driver was annoyed, and did not stop. He stopped about half a km later – I hate that attitude of the passenger. The run ahead was eventless. The bus turned off near Manappulikkavu and headed towards Palakkad bus station. I initially thought we would be picking passengers outside the bus station – but the bus went inside the bus station, and picked passengers from near the fuel station. We reached Palakkad BS at 2301hrs, and left at 2304hrs – after picking up 11 passengers. We now had 49 passengers – 100% occupancy. The conductor checked all the tickets and started distributing water bottles. After this, the curtains were downed. There was fairly good traffic till we crossed Walayar. After Walayar, traffic eased up a bit. The driver maintained fairly good speeds all the time. I dozed off after some time – vaguely remembering exiting the bypass. I slept through the journey after that. I vaguely remember seeing the bus stopped for a break – did not bother to check the time or place. I had quite an uninterrupted sleep – woke up at 0400hrs, when the bus was stopped at Krishnagiri toll gate. The driver was talking out loud to someone. It seems a KaSRTC Volvo had broken down – this guy was advising that driver about how to restart the bus. There was no traffic on the road – absolutely no traffic. I dozed off again. I woke up at around 0500hrs, when the radio was switched on – some radio station was being played, and Suprabhatham was being telecast. I thought we were around Hosur now. The windows were all fogged up – I wiped the glass a bit to try finding out where we were. The conductor now shouts at the top of his voice... “Electraanic City”. OMG! I thought we were in Hosur! We had already crossed into Karnataka, and we were right at Bangalore’s doorstep now! We passed Electronic city bus stop at 0503hrs. One big benefit of taking a KaSRTC service is that they do not take the BETL, but go below the flyover. For people like me, getting off at Bommanahalli is a cost and time saving measure. I got off the bus at Bommanahalli, at 0510hrs. Before getting off, I congratulated the driver – he had a huge smile on his face as he waved back at me, thanking me for the compliment. I walked off, took an auto to head home – I was almost frozen by the time I reached home. 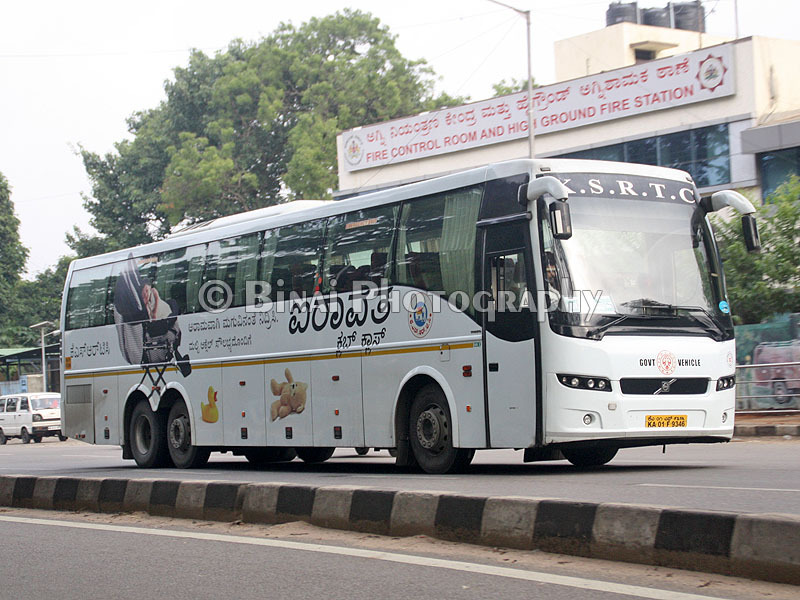 End remarks: The bus, KA-01-F-9346, of Bangalore Depot-4 had about 1.99 lakh kms on the odo. It was maintained in fairly decent shape – there were some rattles here and there. The Airconditioner roof-top unit was very noisy – the typical Carrier AC unit noise, with clicks every now and then. The AC was set to a very comfortable temperature – I did not have to use the blanket much. The running time was amazing – left at 2138hrs (late by 7 minutes) and reached Bommanahalli at 0510hrs. My colleague who got off at Majestic said that the bus was there before 0530hrs! So that is a good 40 minutes before time! The running time came out to 7hrs and 52 minutes (end-to-end) – that would surely be a record for KaSRTC. I was reluctant to take KaSRTC – especially since the reaching time in Bangalore is very critical for me. This journey changed by perception. But, on the day of my journey, traffic on the road was negligible owing to Pongal festival in Tamilnadu. And, KaSRTC rarely has repeatability – the timings on a particular day are heavily dependent on the driver, and no two drivers are alike. I hope to have another wonderful run in KaSRTC again. Will I take this service again: I’d love to try again. But KaSRTC is too unpredictable. I have similar experience most of the time. I travel between Mangalore and Bangalore at least once in a month in past 1.5 yrs. The crew are my friends now! Sometimes they even call me asking if I'm travelling on weekends. Great experience. 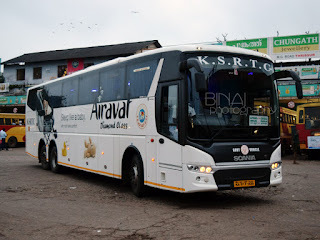 KSRTC AIRAVAT Club class is the best service. I regularly travel by it on Bangalore- Pune route & evrytime the journey is comfortable & awesome. The crew is also very helping & the most important thing I like of Airavat Clubclass service is its punctuality regarding reaching time.